In a small bowl, mix ¾ cup of olive oil, the juice of 1 lemon, ½ teaspoon of garlic powder, ½ teaspoon of paprika, ½ teaspoon of pepper, 1 teaspoon of parsley flakes and 1 tablespoon of teriyaki sauce. Set aside. Pierce the meat with a fork on both sides. Place the meat in large re-sealable plastic bag and pour the marinade over the meat. Refrigerate 1 hour or overnight. Spray the grill with nonstick oil and preheat the grill on medium high heat. Remove the London Broil from the marinade and pat dry with paper towels. Place the meat on the grill and cook 6 to 8 minutes per side for rare, longer for medium rare. 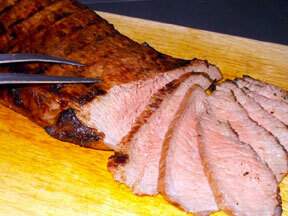 Transfer the London Broil to the cutting board and let rest for 5 minutes before carving. Slice across the grain and serve with your favorite vegetable or salad.